The CoffeeShop Blog: CoffeeShop Vintage Frames 30! I hope everyone had a wonderful Thanksgiving! We had Thanksgiving lunch over at our house this year and it was so fun. Our entire feast was gluten-free and incredibly delicious. My mom's green bean casserole was the best I have ever eaten and I need to get her recipe. It was made completely by scratch. My sister Heather and her family spent the night and we roasted hot dogs and marshmallows with the kids for dinner (kids can always eat...), and then had adult time with wine and a movie after the kids went to bed. Thanksgiving is my favorite holiday; good food, friends and family, and no present buying. It is Black Friday and I never go out and shop the day after Thanksgiving. I hate frantic crowds so we stay at home, eat leftovers, and enjoy the day off with our family. This is one time of the year that I prefer to shop on-line. ;-) I have already done all of my Christmas shopping (my family only buys presents for the kids) so now I can relax and enjoy the season. I love this time of year. Thanks to my obsession with designing vintage digital frames, I have another freebie today. I created this by scratch and I love it. This frame is a simple png file so it opens in most editing programs and you can simply slip your own image behind the frame and save as a png or jpg. 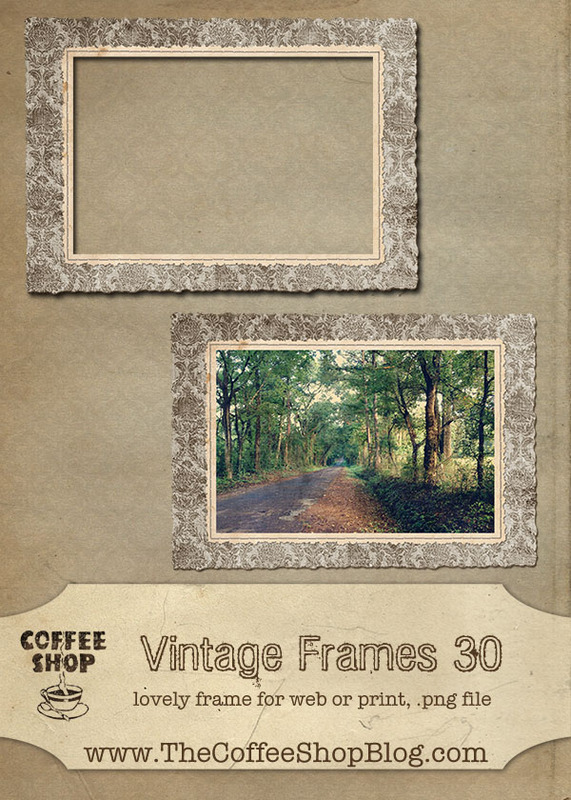 Download the free CoffeeShop Vintage Frames 30. You can also download it here. Do you want to download my favorite CoffeeShop Actions or Design Elements (includes this frame!) in one convenient zipped file AND help support this blog? Just click here for my action pack or here for a download of some of my most popular design elements, storyboards, and textures. I hope you will share the recipe for Green Bean Casserole from your Mom. Sounds like one I would like to make for Christmas dinner. I love these! You're the best, Rita! Thanks!